Tornado tables are the best tables on the market hands down. Some other table brands may limit what shots you can perform, so Tornado tables, such as the Twister II, are the most recommended if you want to truly master the game. However, Tornado does offer different models for home use that vary in table features and offer different tiers of quality when it comes to their parts. The Twister II comes in toward the lower-end of the Tornado tables, but still offers some nice features if you are looking for a good table. The pros of this table are the counterbalanced foosball men and the wooden handles. The counterbalanced men allow you to easily play 1 on 1 games because you can set the men horizontally without the fear of them falling down and getting in your way during game play. Like all Tornado tables, the Twister II foosball table surface is also solid, level and allows for fast foosball shots. We recommend taking a look at the Storm II Tornado table before you purchase a Twister II because it offers 1 1/2 inch side cabinet walls for greater stability and durability as well as adjustable legs. 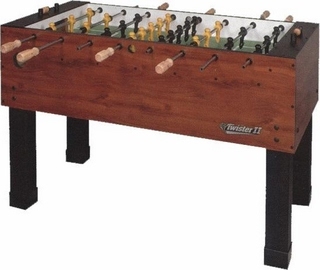 This foosball table is priced around $800 US.